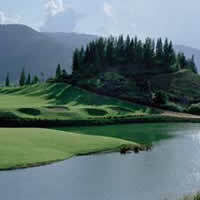 Toscana Valley Golf Course was completed in 2008 by designer Robert McFarland. Toscana Valley acquired its name as they have gone with a Tuscan, Italy Theme and fashioned the clubhouse and surrounding estate to match. The course however is a real beauty it boasts some of the most challenging gameplay in Thailand and beautiful picturesque views from most holes. Several of the par-4s feature 200 yard + water carries. Elevated greens, dramatic fairway drop-offs and seemingly bottomless bunkers are featured on almost every hole. The greens offer challenging play also with big breaks from almost every pin position and sharp contours. As it is a private members club the facilities and service are five star. Golf Carts are compulsory. The restaurants serve very good Italian and Thai food. Weekends are members only.